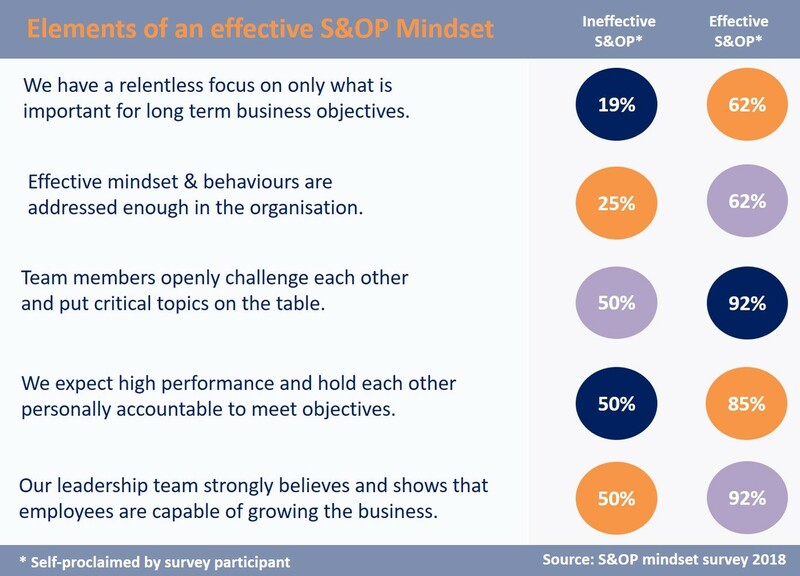 To be most effective, S&OP requires a positive, growth-oriented, mentally tough mindset as well as constructive behaviours. It is unlikely that a critical mass of effective behaviours is present in every company that implements S&OP. On top of this, S&OP practitioners indicate that behaviours are not addressed enough in S&OP implementations. There are different behavioural change requirements during S&OP maturity stages. 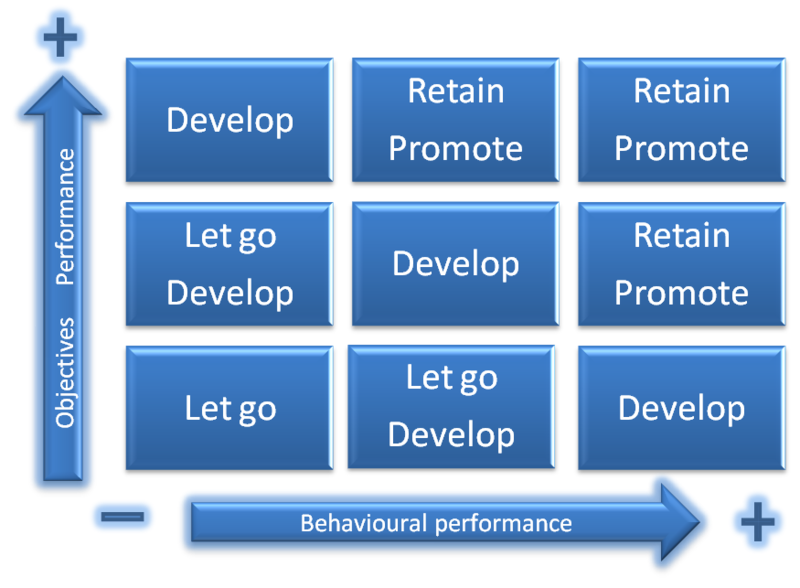 This article suggests three coaching phases to support leaders with behavioural change in their S&OP journey. These are; Coach to change, coach to sustain and coach for excellence. When S&OP is newly implemented, it is often assumed that collaboration and constructive behaviours between functions will automatically follow. Although a horizontal process like S&OP provides a platform for collaboration, it is certainly not a guarantor for it. Although a horizontal process like S&OP provides a platform for collaboration, it is certainly not a guarantor for it. In his experiments on cooperative behaviour, Yochai Benkler (2011) found that 30% of people behave as though they are selfish. Adam Grant (2013) divides people into givers, takers, and matchers. Givers find ways to be helpful to others, takers focus on getting as much as possible from others, whilst matchers can go either way. A willingness to help others achieve their goals lies at the heart of effective collaboration. However, givers only represent about 25% of the population, takers 19%, and matchers make up the rest. Knowing that many people are by default selfish rather than collaborative, it is important to understand that hard work and possibly extra initiatives will be required to change behaviours in support of S&OP. To support these behavioural initiatives, extra coaching resources are likely required and will have to address different types of behavioural change dependent on S&OP maturity. Change is hard. In his groundbreaking 1996 change study, “Leading Change,” John Kotter, concludes that only 30% of companies’ change transformation is successful. McKinsey studies in 2009 and 2013 also supports this conclusion. And of these change failures, 70 percent are due to culture-related issues: employee resistance to change and unsupportive management behaviours. 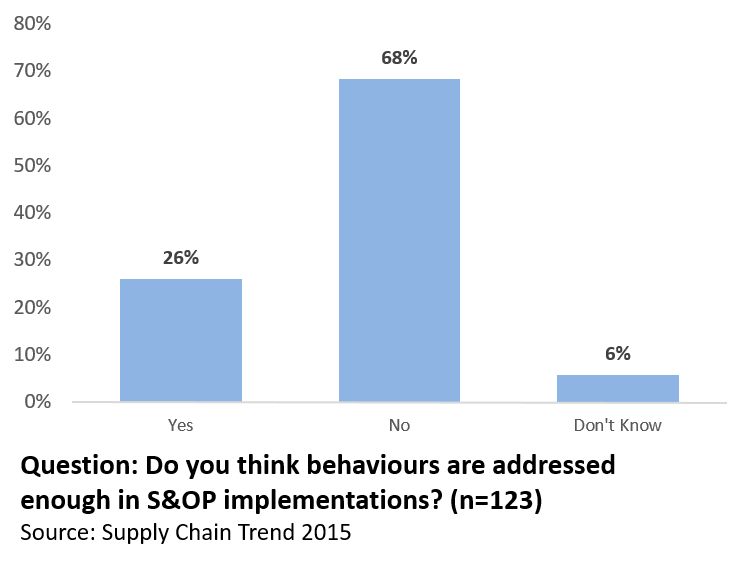 Despite this obvious importance of behaviours in change management, only 26 percent of practitioners indicate that behaviours are addressed enough in S&OP implementations. There are a number of changes during S&OP implementation, you and your company will go through a number of changes to make it happen: Change in processes, systems, and behavior of people. How can you determine in what change environment you’re operating? In his book Beyond the Wall of Resistance, RicMaurer gives three levels at which people resist a change. This is a simple, yet very applicable way to understand a change environment. I’ve used it in practice and added a 4th one based on my experience. Level 1: I don’t get it. This is knowledge driven. There is too much involved, I don’t understand. I don’t really get it. Level 2: I don’t like it. This is an emotional reaction. This is based on fear. People are afraid that this change will cause them to lose face, status, control, maybe even their jobs. Level 3: I don’t like you. Maybe they like you, but they don’t have the trust and confidence in you or your managers S&OP leadership to make it work. Level 4: I like it, but… a person might get it and might like the idea of S&OP, but have so much else on their plate that they don’t have the head space to support it actively. Change fatigue plays a role. These levels of resistance can be present in every echelon of an organization. You cannot make every senior leader or stakeholder understand S&OP, like it, and/or like the leadership. As a leader of S&OP change, you have to understand the dynamics of your own change environment. Therefor it is a good practice to have conversations with all the main S&OP stakeholders and assess what type of resistance, if any, they show. 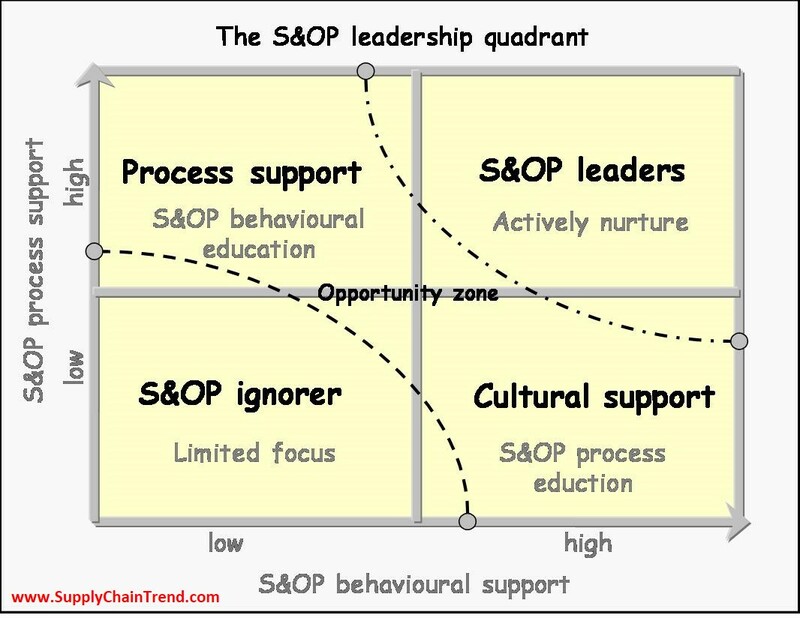 I developed the S&OP leadership quadrant to map your S&OP change environment based on process and behavioural support. If in your change assessment you find S&OP leaders who show evidence of supporting the S&OP process as well as displaying the right behaviours, nurture them. Ask them to actively display their behaviours and influence other leaders to follow these behaviours. If you find resistance, map the type and make a plan to address it. Level 1 resistance is the easiest. It doesn’t need coaching and can be overcome by good education. Level 3 is harder, it is about internal politics, but can be overcome by showing your knowledge, building trust and relationships between functions. Level 4 is seen in many large organizations that had change on change one change. It can be addressed by re-prioritizing workload or provide additional resources. A coach could help with time management or help to deal with the pressure. 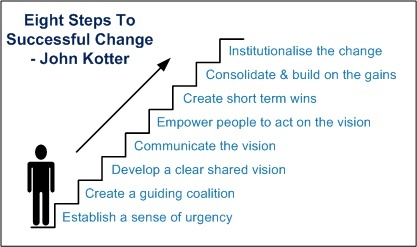 Great change management as for examples Kotter’s 8 steps will also very much help to overcome these types of resistance. Change is hardest when you discover Level 2 resistance, especially at the senior leadership level. Level 2 resistance is emotional, has deeper underlying reasons and will be reflected in the behaviours these individuals display. If there is a critical mass of senior leaders who do not support S&OP because of level 2 resistance, leading S&OP change will be nearly impossible. S&OP with level 2 resistance will most likely not mature beyond basic demand and supply balancing. To make S&OP change happen, you have to address the emotions and behaviours. Individuals who show level 2 resistance and display fear of losing status or control due to an upcoming S&OP implementation, mostly do this because of security needs. Their thinking and behaving will be influenced by their need to protect themselves against basic S&OP principles. Principles like open communications, transparent data usage, public information sharing make them nervous. They fear the cross functional visibility in their KPI’s, progress of projects and functional performance. These individuals might prefer a command and control leadership style and fear to lose control in an S&OP environment. They might have a lack of self-worth or confidence and have a fear of failure in public meetings. They might have a fixed mindset, believing there is no opportunity for growth. They might prefer to maintain the status quo and feel anxiety when being challenged to do something new. Keep in mind that we all developed our preferences over our life journey and many of us will operate with a certain style without even being self- aware about it. The underlying beliefs, values and thoughts an individual has are all under the surface, what we see is only the top of the iceberg; their behaviours. Security needs can result in oppositional behaviours like criticizing without the intention to improve, talking the need for the S&OP process down or blaming and emphasizing minor flaws in S&OP data, process or supporting people. Lack of confidence or growth mindset can result in showing avoidance by not joining conversations, provide the minimum amount of data or show a lack of commitment in general. It can of course get much worse when people start playing power games, purposeful hide data, obstruct the S&OP process and start controlling others to do the same. We can’t say this behaviour is wrong! These behaviours have been developed over a lifetime in support of security needs and to reduce personal anxiety. However, we can say these behaviours are not effective; in life, in business and more specifically in S&OP. This is where coaching to change comes in. If we want to drive behavioural change, we can’t just tell individuals how they should behave. This is what consultancies do and that’s ok. However, some consultancies call themselves coaches when all they do is show a powerpoint to tell what type of behaviours are preferred in an S&OP cycle. A coach doesn’t tell how to behave. A coach listens to all the underlying reasons why a certain behaviours are a challenge for an individual. Then a coach actually helps to create awareness and understanding of their current behaviour and the impact. Then a coach helps a coaching counterpart or an organization to develop more effective behaviours. Then a coach needs to guide an individual in accepting that these behaviours are not effective. Finally, once an individual has accepted a need for change in their behaviours, a coach can help create an action plan to develop more effective behaviours. The coach will follow through and hold a person accountable to stick to the improvement plan, but also provides intervention techniques a person can use in real life situation like an S&OP meeting. This coaching process is time consuming and significantly different than consulting. Coaching to change will be applied in the early life cycle of S&OP. During the S&OP implementation and the early S&OP phases. It supports the behavioural change management required for S&OP and has the objective to develop a critical mass of senior leader that show preferred S&OP behaviours. Once this critical mass is reached, there has been enough change and acceptance to mature both S&OP and behaviours further. Once a company has developed critical mass of senior leaders and other S&OP stakeholders who after the S&OP implementation support the process and behavioural principles, there is commitment to the process disciplines, meetings and data inputs and outputs. Basic S&OP behavioural principles like open communications, transparent data usage, public information sharing, conflict resolution, follow through on actions and cross functional cooperation will start to be common. To further cement these behaviours and make the newly build S&OP foundation more sustainable, firstly behaviours need to be included in the company’s operating model. Secondly, business trust and communication capability need to be developed. If a company has defined set of S&OP behaviours they think are effective, they also need to hold people accountable to live those values. Why otherwise defining them in the first place? This can mean that meeting participant share feedback after an S&OP meeting if values and behaviours were lived well. Even when discussions are heated, values need to be lived. If it is too confronting or culturally not feasible to start this in public it can be done through a written 360 degrees feedback form. A passionate and capable S&OP manager can lead this feedback conversation and will not be afraid to hold the most senior leaders to account to participate. Preferred company and S&OP behaviours also can be added to induction materials, job descriptions and made part of the interview process. Performance reviews need to be done based on results and the behaviours used to achieve those results. And people people need to be held to account. Below schedule can be used for this during performance reviews. On top of having behavioural conversations as part of an operating model, two other core elements of S&OP need to be developed. We need to coach to sustain and improve Trust and Communication. 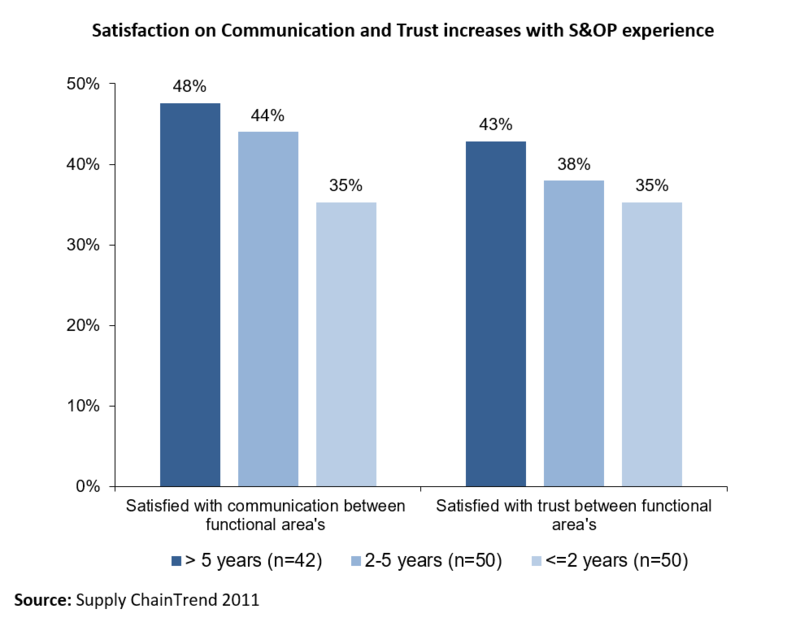 My S&OP surveys show that satisfaction on trust and communication increases slightly with S&OP experience. However, even with more than five years of S&OP experience, less than 50% of survey participant indicate they are satisfied with the levels of trust and communication. What follows are some tips to accelerate the improvement of trust and communication. Trust has been suggested as one of the most important predictors of positive organizational outcomes and is also linked to positively affect psychological well-being. Increased trust also improves and smooths the basic S&OP behaviours. In the article Corporate culture and S&OP: why culture counts, Trustworthiness is mentioned as a key cultural element to support S&OP by professor John Mello. Trust is the invisible gel that makes about anything work faster. In the ‘The Speed of Trust’, Stephen Covey shares many examples how speed goes up and costs go down when trust increases in a businesses. It is also a major foundation in team effectiveness. 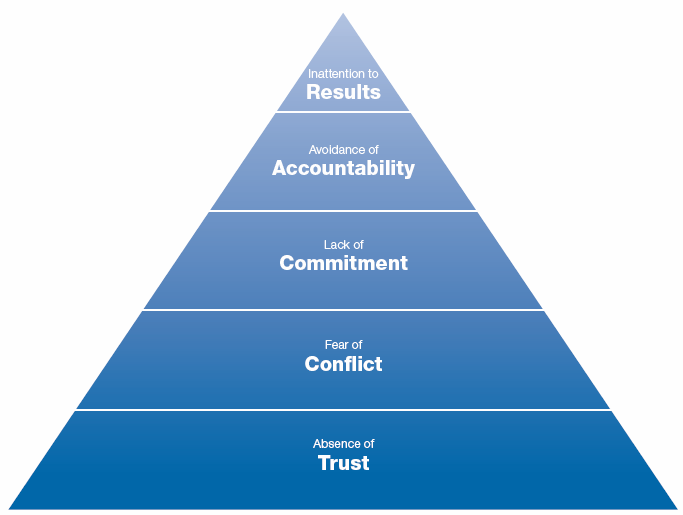 As Patrick Lencioni shows nicely in The Five Dysfunctions of a Team, without trust in teams, there is a fear of conflict, lack of commitment, avoidance accountability and inattention to results. On top of this, the latest research from neuroscientists (Zak, 2017) shows that, compared to low-trust companies, people at high-trust companies report 74% less stress, 106% more energy at work, 50% higher productivity and 29% more satisfaction with their lives. Building trust doesn’t happen overnight and there are many ways to improve trust, but here are some examples I used to build trust in a business. Trust workshops: In one business I worked for, I facilitated trust workshops with the top 40 leaders. 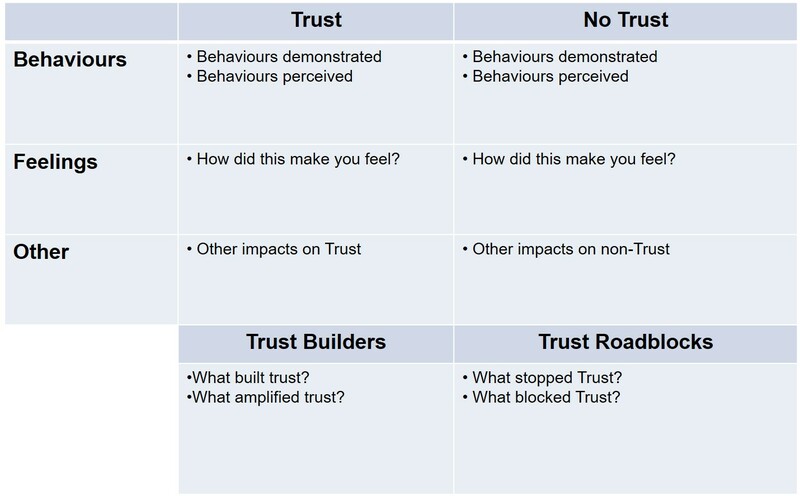 In these sessions we identified trust builders and trust roadblocks. Key themes were fed back to the MD and we followed up with actions to address the key themes in S&OP, team meetings and the general business. Find below the framework I developed to gather feedback during those workshops. Get personal: a simple but great way to build trust is to get personal with your team and colleagues and start to get to know them privately. A great outcome of the trust workshops was that people started to understand each other’s business and personal issues better. This developed stronger, more trustful, relationships. Keep ‘getting personal’ in mind when organizing company off sites, business drinks, lunches or team efforts like working for a good cause. Embrace Trust behaviours: Use the 13 behaviours from Covey that create trust (talk straight, demonstrate respect, create transparency, listen first, keep commitments, get better etc.). Select a few and start focusing on using them in your team and S&OP meetings. Provide each other feedback after S&OP meetings on these specific trust creating behaviours. Increase Self-awareness: self-thought and perceptions have impact on how people deal with trust. Do they grant trust a colleague, or does a colleague has to earn it? How will trust be breached and how does an individual deal with that emotionally? This is where coaching and psychometric behavioural tool like Mental Toughness or Life Styles Inventory can support further. A good hard look in the mirror is also a good start! Having an S&OP communication plan as part of a corporate communication plan, is a sign of S&OP maturity. With a S&OP communication plan, executives can inform, energize and re-focuses employees and call out for action to fill budget or strategy gaps. However, S&OP is first of all about improving horizontal communication and consensus between functions. To improve horizontal communication, we have to train and educate employees to give them a proper communication tool set. Furthermore, we can coach them to take away any individual obstacle that holds them back from communicating effectively. Here are some communication skills I learned and applied over the years. Listening: often forgotten as part of communication. Active listening or listening with empathy as Covey writes in The 7 Habits of Highly Effective People. Mindful listening, which can be trained with meditation. Listen with the intention to be influenced and find a win-win opportunities. Techniques: listening techniques like reflecting, clarification, summarizing, paraphrasing can be trained to improve communication. Story telling: we often bore each other with left brain communication, based on facts, numbers and logic. Story telling activates the right brain and connects an audience on a deeper level. This improves engagement and your story will be remembered better. Give and receive feedback: Providing constructive feedback is a gift, and shows that you care about the other person. Receiving feedback and take it as a learning, without the need to react, requires training for many. Start to use roundtable feedback from every senior leader after an executive S&OP. Develop curiosity: Again tapping in to the right brain. Develop curiosity to seek to understand before being understood (again a habit from Covey) to develop a deep understanding of what the other wants and needs. Body language: become conscious of your body language and learn to control it. Constructive body language engages the audience. Leaning in, eye contact, mindful and generous with a smile always wins from arms crossed, absent minded, staring down or laying back on your chair. Even with supporting workshops and training on trust and communication, some individuals will still find it hard to apply their learned skills. For example, an individual with a lack of confidence will find it harder to communicate across functions or provide feedback to a person. This person might also find it hard to display trust behaviours like talking straight and displaying transparency. Interpersonal confidence is an attribute of Mental Toughness and can be measured on individual and on team level. Like many personal traits, confidence can be improved and in this case could have a positive impact on trust and communication in support of S&OP. These types of interventions require advanced coaching techniques and coaching for self-excellence. Coaching on other personal traits and behaviours can help improve strengths or unlock hidden potential and helps an individual be the best version of themselves. To start coaching for excellence, it is useful to have a proven and objective behavioural measurement as benchmark and conversation starter. Furthermore, we need a coaching method to give structure to the conversation and guide the individual change process. To create behavioural awareness, we need an objective measurement. This is often where psychometric measurements come in. A psychometric tool simply seeks to make predictions about some of the aspects of people completing it. However, a business needs to be careful to select the right tool to improve behavioural effectiveness and performance. Well known psychometric tools like DISC and Myers-Briggs are very valuable to helps individuals to understand themselves and others. However, these tools measure preferences or personality rather than thinking styles, behaviours or mindset. Personal preferences are relatively stable and hard to change, whilst self-thought, behaviours and mindset can be changed through coaching. As the most used psychometric tool in the world, Myers Briggs is based on only one psychologic insight; Carl Jung’s theory of psychological types, whilst other tools use a variety of well-known psychologist. But most importantly, in Myers Briggs, no preference or personality type is considered ‘superior’ or more effective to other preferences. If our objective is to seek more effective S&OP and performance improvement through behavioural excellence, we therefor need a psychometric tool that provides a strong basis for that. Personality measurements hardly provide that basis. Psychometric tools like Mental Toughness, Life Styles Inventory (LSI) and Emotional Intelligence do measure thinking and behaving, are proven to be changeable and are positively associated with better individual health, well-being and performance. The below graph show some researched examples. Mental Toughness is positively associated with increased performance improvement, reduced stress and better decision making under pressure. The constructive behavioural styles in LSI are positively associated with inter-unit coordination, work relationships and external adaptability. These are all very important aspects of S&OP and measuring and improving the thinking and behaviours associated with those aspects will make S&OP more effective. 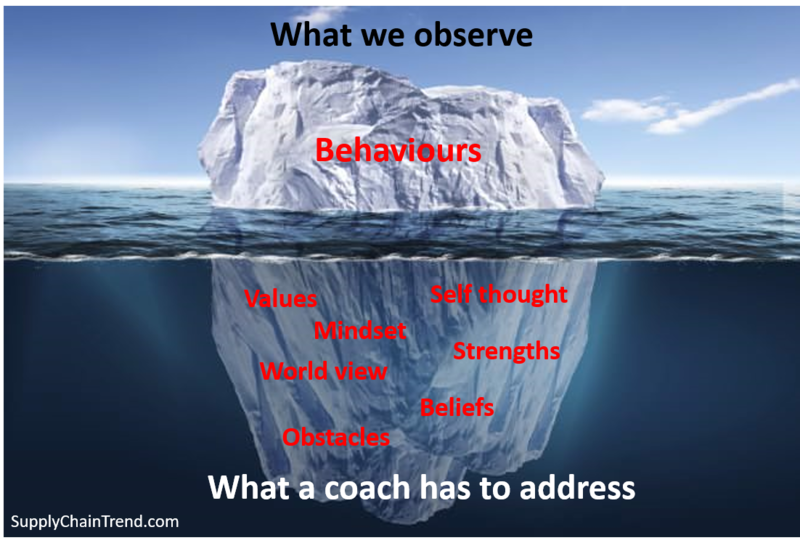 To coach individual to improve their behaviours, we can’t just tell them what effective behaviours, how to think and behave and then expect that this will change. We need to help them create awareness and help develop more effective behaviours. It takes structure and a considerable amount of time to make individuals aware, accept and take action on their mindset and behaviours. Many people are not even aware of some of their behaviours and the impact on themselves and others. To structure conversations and help with the individual change management we can use coaching models. 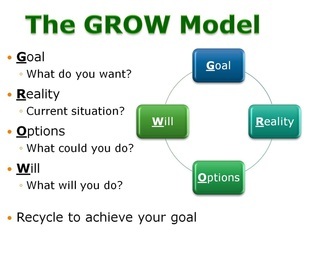 One of the most common models is the GROW model. The GROW model starts with the Goal, the end point where the coachee wants to be. Once the goal is clearly defined, the focus is on the Reality, to create an understanding on how far they are from reaching their goals and what issues and challenges they have. Challenges and issues will define the Obstacles for which Options can be identified. That last step is to convert options to actions and a Way forward. Another coaching approach is triple A. A coach has to create behavioural Awareness in the coachee. Then a coach needs to guide an individual in Accepting that these behaviours are not effective. Without acceptance we can’t move on to the next step; Action. Once an individual has accepted a need for change in their behaviours, a coach can help create an action plan to develop more effective behaviours. The coach will follow through and hold a person accountable to stick to the improvement plan. A coach will also provide intervention techniques a person can use in real life situation like an S&OP meeting. A critical mass of senior leaders with increased self-awareness, emotional intelligence and the willingness to detect, manage and improve their own behaviours, will have a positive effect on S&OP effectiveness and business in general. The boardroom environment, S&OP meetings and day to day business will show improved listening, constructive challenge to come with better solutions, risk appetite, commitment and follow through on actions. We will see improved relations with better cross functional working and individual satisfaction, health well-being and performance. Rather than seeing mindset, behaviours and company culture as obstacles to implementing and developing S&OP, we should view S&OP as an opportunity to shape and improve company culture. when a CEO drives the right behaviors through S&OP, the cycle over time becomes more effective and more valuable for all executives. If the behaviors include increase trust levels, additional benefits will accrue in terms of increased earnings, reduced employee stress, more energy, higher productivity and increased life satisfaction. Let’s take the example of a senior executive from a multi-billion $ company I coached. With the help of the Mental Toughness psychometric tool, we discovered that this individual struggled with challenging the CEO and peers in the leadership team. A lack of challenge in the boardroom, leads to Groupthink. Groupthink is a psychological phenomenon, which occurs when a group of people, in which the desire for harmony results in an irrational or dysfunctional decision-making outcome. The whole boardroom goes along with the same decision, because it is easier. In a recent interview in the Australian, chief executive of the Australian Institute of Company Directors, John Brogden, states that Groupthink is the greatest risk to corporate growth in Australia. The opposite of groupthink is psychological safety, a shared belief where team members feel accepted and respected, and a study by Google of over 180 organizations reported that psychological safety is by far the biggest contributor to team effectiveness (Rozovsky, 2015). Once my coaching counterpart developed this awareness, the coaching conversation could focus on how to address and improve challenging the status quo in the boardroom. A lot of the coaching conversation focused on self-thought, self-confidence and techniques on how to work towards asking a tough and challenging question to the CEO. Coaching this individual on personal traits like confidence and challenge did unlock hidden potential, helped this individual and indirectly the business. To be most effective S&OP requires the right mindset and constructive behaviours. It is unlikely that these exists within every company that implements S&OP. Therefor mindset and behaviours need to be addressed additional to an S&OP implementation. Coaching resources need to be made available to support these mindset and behavioral initiatives. 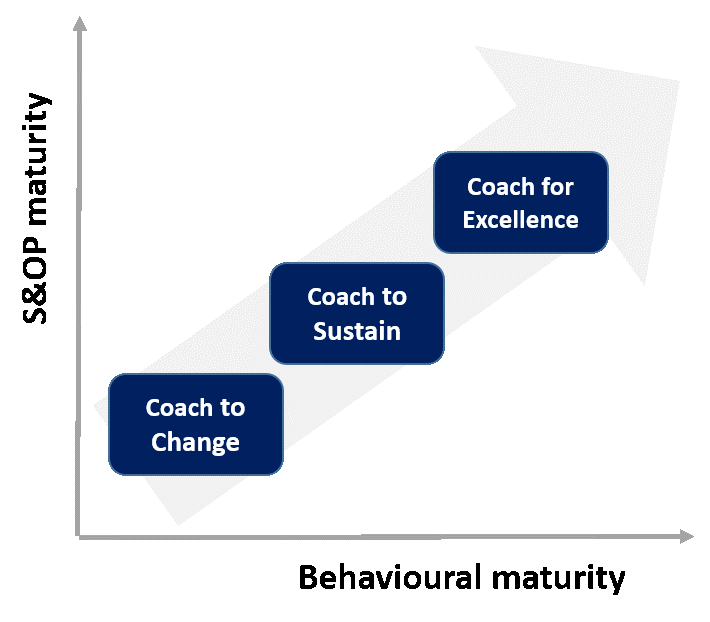 Dependent on the company and S&OP maturity, there are different coaching phases to focus on; coach to change, coach to sustain and coaching for excellence. If implemented well and made part of the company culture, constructive behavioural change improves S&OP effectiveness, however it also improves employee engagement and psychological well-being. Thank you for this wonderful blog, Niels. You’ve really nailed the biggest gaps that companies face with S&OP or IBP – people and behaviors. And I’ve yet to see a company put an individual or organization in place to change and sustain behaviors. How do you make the sales pitch to a company to make the commitment long-term? It seems obvious. Thanks Rob, I know some companies that take coaching on behaviours seriously, but looking at the research that show the upside of effective mindset and behaviours for both the employee personally as the business, it is mind boggling that this has not yet seen a wide adoption.